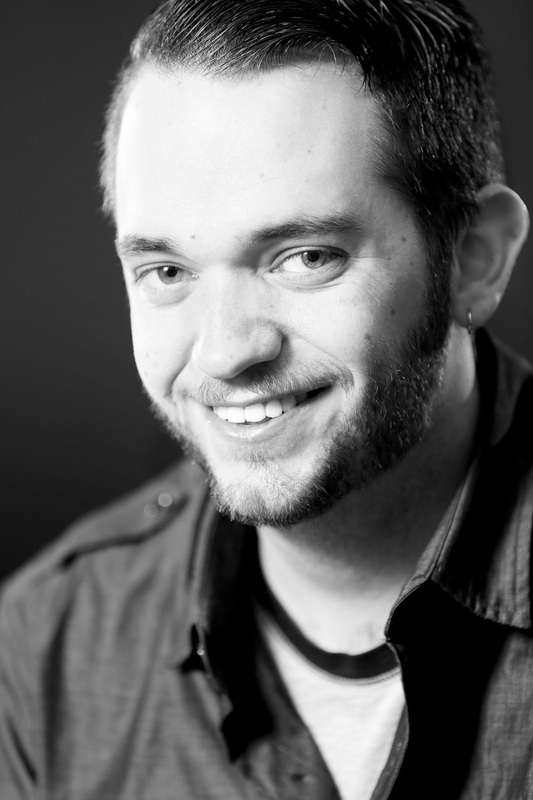 California video game designer Adam Clark knows that, in his business, authenticity is the key. So, for their newest Western adventure game, he and his partners decide to try out Cowboy Camp. Only Adam’s friends never arrive, leaving him a bit—okay, a lot—preoccupied, trying to resist the gorgeous cowgirl who owns the ranch. Single mom Skye Hawkins is too busy trying to keep her family’s dude ranch out of the red to even think about romance. But she’s having trouble avoiding Adam. He’s smart, he’s sweet, he’s funny…and he’s hot! Maybe it’s the mountain air, but she finds herself letting down her guard. And the fireworks are definitely worth it. The only problem—they live in totally different worlds. Still, Adam is nothing if not resourceful. Sure, he wants to catch the cowgirl. But more importantly, he needs to find a way to keep her. Hunky cowboys, cops, and hockey players! Find them in the following series: The Page Turners, The Hearts of Montana, The Bannister Brothers Books, and the Cotton Creek Romances. Pikes Peak Writers Write Brains: What's in it for You? I mark the third Tuesday of every month on my calendar. 6:15. Library 21C. Write Brain. These two-hour workshops focus on improving writers and authors. 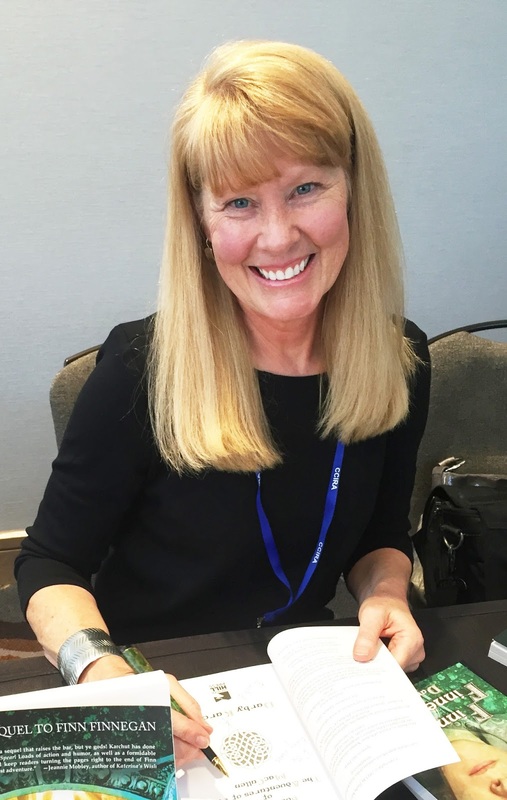 Educators at Write Brain range from published novelists, short story authors, and non-fiction writers to agents, editors, and marketing experts. Write Brain consistently provides wonderful insights into the breadth and depth of what it means to be both a writer and an author. There is a difference. A writer is an artist, a creative person who composes narrative/prose/poetry/etc. An author is someone who does likewise as part of his or her livelihood. Attending Write Brain taught me this. Like so many others, I first approached writing as simply sitting down and putting to paper what was stirring in my brain. Little did I know at the time how much more there was to the process. Also, I was oblivious to what it took to get published and find readers. 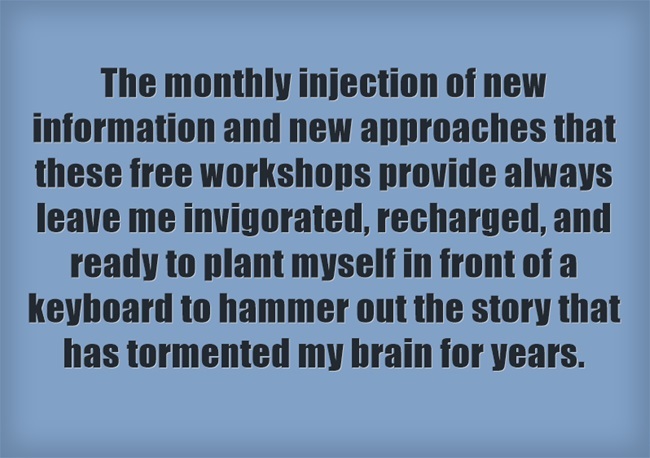 I started attending the Pikes Peak Writers Write Brain workshops in 2015. Write Brain showed me Scrivener, the fantastic word processor and organizational tool on steroids. From Write Brain I learned the necessaries of marketing and how much of an author’s time must be committed to it, whether traditionally or self-published. A recent workshop used neuroscience to explain what story elements engage readers and why, giving fiction writers a road map to keep readers turning pages. These workshops spurred me to relook at my work in progress. They made me reassess whether I wanted to put in the work to finish a manuscript, query, network, market, and all the rest of it. They motivated me to participate in the Pike’s Peak Writer’s Conference and get my work in front of agents. 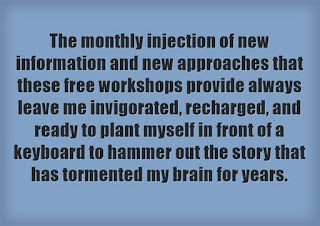 The monthly injection of new information and new approaches that these free workshops provide always leave me invigorated, recharged, and ready to plant myself in front of a keyboard to hammer out the story that has tormented my brain for years. Each Write Brain workshop is selected by the Pikes Peak Writers Non-Conference Events (NCE) committee from the hundreds of submissions on our workshop proposal portal. Have an idea for Write Brain or want to see a particular subject covered at a workshop? Go to https://www.pikespeakwriters.com/proposing-a-workshop/, read through, follow the guidelines, and click on the corresponding link to fill out a submission form. Better yet, join PPW here and volunteer to assist on NCE! Then, you can help decide which workshops get on the calendar for Write Brain. Congratulations to Author Barbara Nickless for taking Colorado by storm. 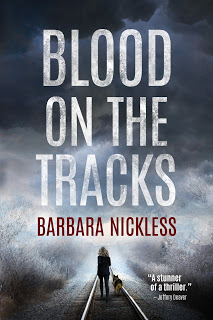 Barbara Nickless's debut novel, Blood on the Tracks, won the 2017 Colorado Authors' League Writing Award for genre fiction. Barbara's next book in the series, DEAD STOP, will be released by Thomas & Mercer on October 3rd, 2017. Barbara Nickless's debut novel, Blood on the Tracks, won the 2017 Colorado Book Award for mystery fiction. Barbara's next book in the series, DEAD STOP, will be released by Thomas & Mercer on October 3rd, 2017. According to Donald Maass, New York agent and author of writing how-to books that push writers to new levels: "Your protagonist is your vengeance. Let him loose." One day with Donald Maass provided nearly an entire writing conference worth of inspiration and education. He opened by stating that our goal as writers should be to take the reader on an emotional journey. How do you do this? Not, as you might think, by getting the reader to feel what the characters feel. thoughts at odd moments. Works that have changed you in some way. These aren’t necessarily classics – well-written genre fiction can have the same impact. These are the stories that connected with you emotionally, and perhaps even elevated the way you perceived your own experiences. I’d never won a scholarship before. Teachers and advisers were always very specific on how to write applications on what to say, and I never won. For the 2017 Pikes Peak Writers Conference I decided that if I didn’t win, that was okay. So I wrote in my own voice in a way that felt natural to me as a writer, and I won. You can imagine my surprise, and my gratitude. Consisting of three primary days with an optional fourth day prequel, PPWC is packed with over 400 regularly lonesome people who get this rare opportunity to remember that they are not, in fact, alone. Instead, we get to leave the doldrums of our day-to-day lives and submerge alongside kindred creative souls for a few precious moments and take everything we can out of it. It’s all such a whirlwind etched in crystalline clarity in my memory. The Thursday prequel was my first such course ever and let me tell you, it’s not something to miss. I walked out of that room eight hours wiser and laden with over fifteen pages of notes, and conference hadn’t officially kicked off yet. Dinner on Thursday was spent connecting with old friends and getting introduced to wonderful new ones as we all orbited around the bar and restaurant, and Friday came early. 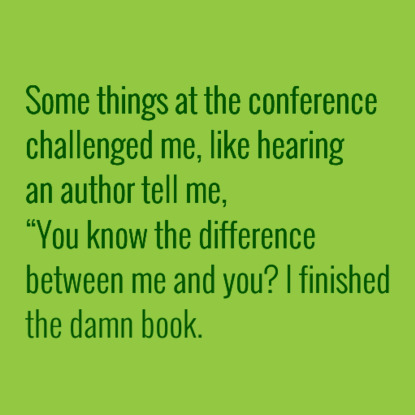 Now, this was my fifth writing conference and my eighth conference overall, so I’ve done this a few times. With that in mind, I can’t say I’ve ever been around a group of people who not only showed, but who positively radiated welcoming energy. Everyone attends conference with similar umbrellas of interest, from community to ideas, from pitching to networking, to simply observing. It’s all worth it, and you have nothing to fear from your own people. my own to pitch. I’m not ready on my second book, and I was just fine with that. 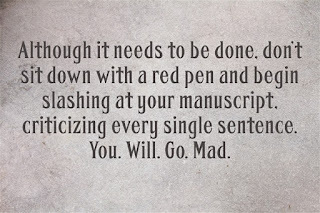 So this time I had the unique pleasure of absolutely no stress over getting my manuscript critically analyzed—as manuscripts should be, mind you. These are professionals and their time deserves your best effort—by an acquiring agent or editor. Many people (including myself) have come to cons before with the hopes of catching your dream agents’ eye and, ideally, business card. Let me say this right now: it absolutely happens. People pitch a book at cons and eventually make it big, but you have to attend. If you don’t come to cons, you’ll never get that opportunity. As previously stated, these things are packed. The sessions are loaded with more information than you can possibly acquire in three days, and each regular lunch and dinner had a mind-blowing keynote speaker. They were inspirational, hilarious, personal, dark, and dire, and I loved it. The costume dinner on Friday night had the entire main hall roaring with laughter, and legends of the antics of the many, many writers who drink at BarCon (the fun name for everyone hitting the bar later) spreads like wildfire. After all, it’s where all of the introverts finally get a chance to spread our oft-timid wings. 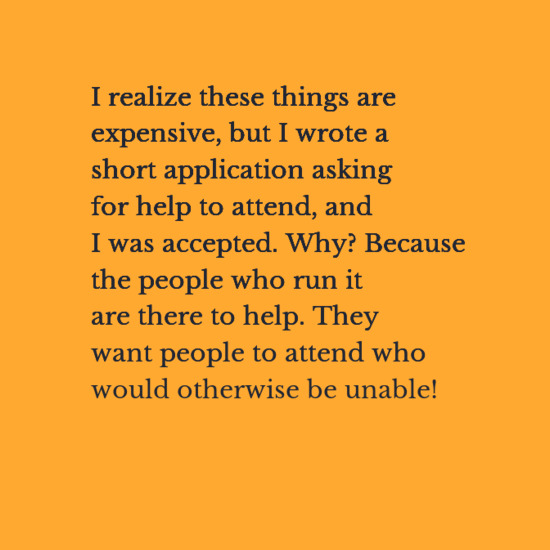 I realize these things are expensive, but I wrote a short application asking for help to attend, and I was accepted. Why? Because the people who run it are there to help. They want people to attend who would otherwise be unable! So don’t let money stop you. Don’t have a book ready? Doesn’t matter. You can still learn. Never written a word in your life? Great! Get in! The sessions are mostly an hour long, and they literally have something for anyone who has any interest in books or words in general! I’m serious! And let’s say you show up, you have no idea who anyone is, you have no work, and you haven’t read a book in a decade, here’s my advice to you: Be friendly, be genuine, ask for help, and don’t let it overwhelm you. It is physically impossible to take in the entire con, so you do what you can, and you take that with you. That’s all that matters. Take what you want from these things, and attend without regret, that’s all I ask. I know it’s what I do. 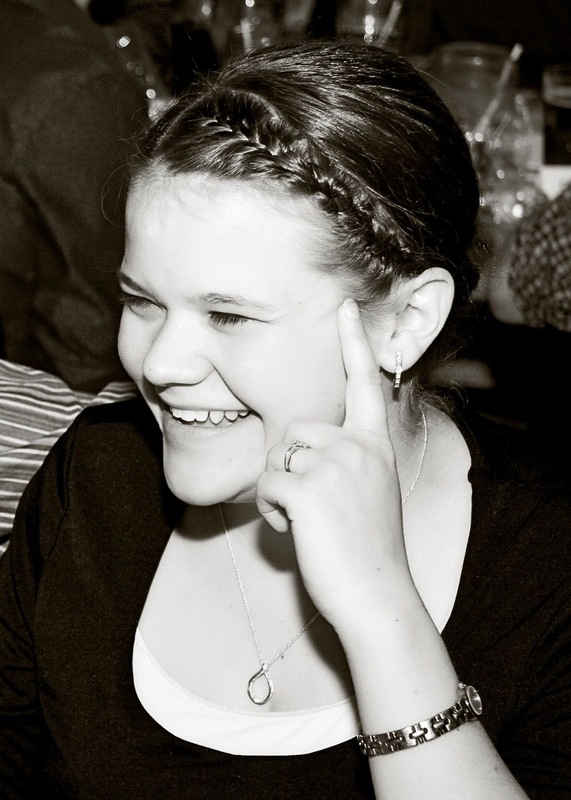 About the Author: A Colorado native, Mason J. Torall is an eclectic hobbyist. When he isn’t writing or working the odd day job, he tests board games with friends, samples Denver’s booming local fare, and bikes the metro area. A huge advocate for sustainable engineering, he spends much of his free time drafting his own engineering designs and training with technical and artistic software. His first novel, The Dark Element, is currently available on Amazon and Kindle, and he is currently working on the sequel. 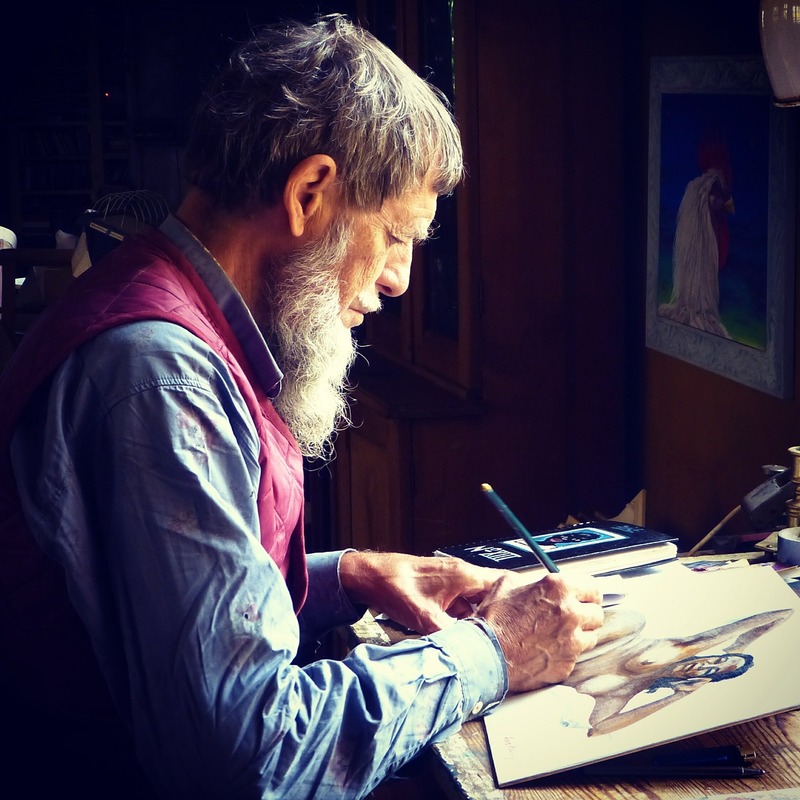 He lives alone in South Denver, where there is still space to think. 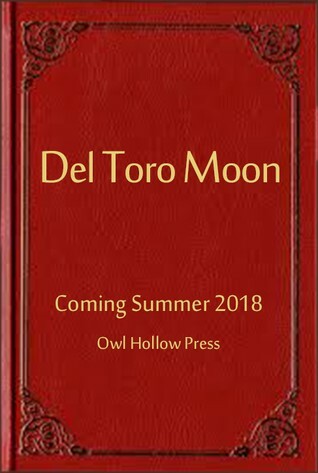 Darby Karchut’s DEL TORO MOON (middle grade fantasy/western mashup), received multiple offers before being sold to Hannah Smith at Owl Hollow Press, in a nice deal, for publication Summer 2018, by Amanda Rutter at Red Sofa Literary (World Rights). Bad enough Matt Del Toro is the greenest greenhorn in the family’s centuries-old business: riding down and destroying werewolf-like creatures, known as skinners. He must also learn how to match his father’s skills at monster hunting. Odds of doing that? Yeah, about a million to one. Because Matt’s father is the legendary Javier Del Toro—hunter, scholar, and a true caballero: a gentleman of the horse. Now, with the skinners multiplying, both in numbers and in ferocity, Matt is desperate to keep his father and hot-tempered older brother from killing each other, prevent his new friend, Perry—a horse-crazy girl who recently moved to their small town of Huerfano, Colorado—from discovering the true nature of his odder-than-oddball family, and save a group of archeologists from getting skinner-ed. A little over a year ago, the idea for a novel got its teeth into me, and the thing just wouldn’t let go. Never mind that I wasn’t really sure where writing a novel could possibly fit into my schedule. Never mind that, in doing research (I’m writing historical fiction), I’d have to read enough books to fill a bathtub. Never mind that the longest thing I’d ever written before attempting this novel was 25 measly pages, and that was in college, for heaven’s sake. The novel didn’t care, though, about any of that. It lurked around like a stray cat yowling to be fed. Maybe just to shut the thing up, I wrote a little bit; when it kept yowling, I wrote a bit more. The more I wrote, the more real the characters became. They acquired backstories and habits and inconsistencies, and they started making all kinds of choices. The problems facing them were like knots I just kept cinching tighter, worrying all the while that I wouldn’t be able to unravel them. So for a year, I worked on it, and I made, basically, a mess. That’s where I got stuck. I couldn’t figure out what I needed to do to move the novel forward, so I kept going around and around what I’d already written, caught in a writer’s eddy of endless revisions. It was around this time I decided I needed a writer’s conference. I needed a place where I could take a step back from my ordinary life and view my work with some kind of perspective. I needed to clear away all the noise. 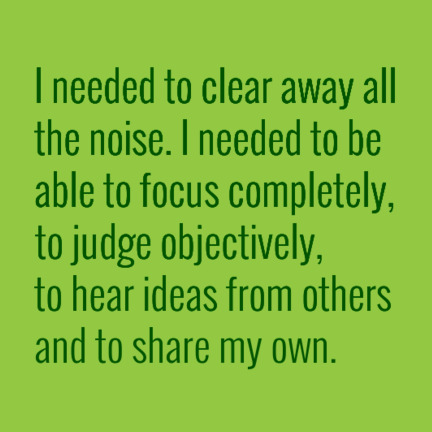 I needed to be able to focus completely, to judge objectively, to hear ideas from others and to share my own. Pikes Peak Writer’s Conference wound up being exactly what I needed. Four days jam-packed with workshops on everything from character development to time management. I drank a lot of coffee and scribbled a lot of notes and considered my story from every angle. By the end of the weekend, I knew what I needed to unravel all those knots. Some things at the conference encouraged me, for instance one agent calling his audience to write—no matter what—with honesty and hope, because we are hoping not just to tell a good story but to change hearts, to change who someone is, even in some small way. It’s a hope that I’ve always had, but maybe lost sight of, and hearing it come from someone else’s mouth suddenly gave me faith again in the rightness of it. 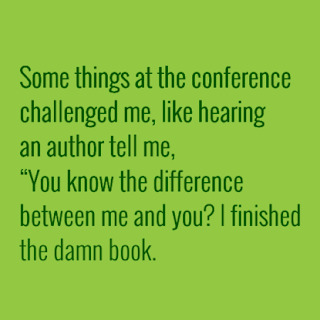 Some things at the conference challenged me, like hearing an author tell me, “You know the difference between me and you? I finished the damn book. That’s really it.” Somehow, I believed him. Finally, some things at the conference put my book on an operating table, opened it up, and showed me exactly where I needed to put the stitches in. By breaking the writing into components—character, plot arc, setting, dialogue—the whole project suddenly felt possible, even probable. I just have to go home, pick up the tools I’ve acquired, and use them. I left PPWC not only with a renewed fire for writing fiction, but with the tools I needed to finish the damn book. 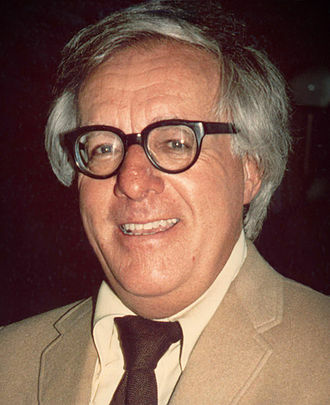 Ray Douglas Bradbury (August 22, 1920 – June 5, 2012) was an American author and screenwriter. He worked in a variety of genres, including fantasy, science fiction, horror and mystery fiction. Widely known for his dystopian novel Fahrenheit 451 (1953), and his science fiction and horror story collections The Martian Chronicles (1950), The Illustrated Man (1951), and I Sing the Body Electric (1969), Bradbury was one of the most celebrated 20th- and 21st-century American writers. While most of his best-known work is in speculative fiction, he also wrote in other genres, such as the coming-of-age novel Dandelion Wine (1957) or the fictionalized memoir Green Shadows, White Whale (1992). 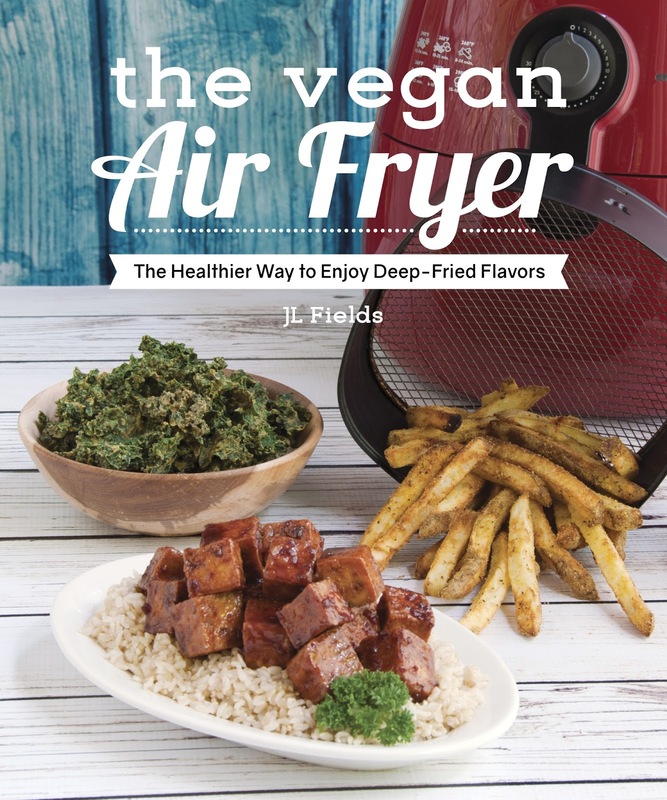 Pikes Peak Writer member and PPWC faculty member JL Field’s next book will be released June 6: The Vegan Air Fryer: The Healthier Way to Enjoy Deep-Fried Flavors. Join JL for her book release party from noon to 2 p.m. on June 17, 12 to 2 p.m., at Colorado Common Hard Cider. All are welcome! 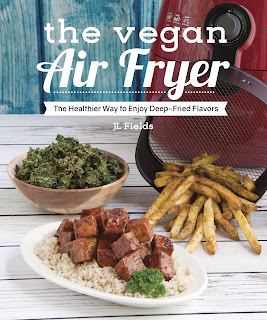 First 75 people get a free drink coupon (if over 21), free recipes samples from the book, vegan food truck fare for purchase, and everyone in attendance is entered in a free drawing to win an air fryer! You can make a number of mistakes in fiction. I see them in bestselling authors all the time. But the big mistake writers make, the one the marketplace finds unforgivable, and the one that keeps most writers from being published, is what I call The Big Mistake. The Big Mistake is to have a character bumping along for the ride without telling the reader anything, or very little, about what the character wants and what their goals are. This is, in essence, a lack of ability to tell a story. 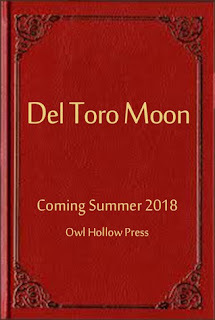 If a novel like that gets published (and it probably won’t in this market) it’ll be a toilet tank book. You know, the book someone started on a potty break, put down on the toilet tank and left there. The story won’t stay with the reader. What’s interesting to me is how simple this sounds. I was one of those people who nodded my head agreeably, yah, yah, yah, about what I thought was a restatement of the obvious. I find this funny now, because clearly I didn’t get it either. The feedback I got on my first novel before it was published was after readers trudged through fifty pages, they couldn’t put it down. But that first fifty was a death march. I got all kinds of advice on how to fix this. I was advised to cut the first fifty and start the book there, sprinkling in information from the cut portion into the rest of the book. But it wasn’t a plot where I could do that. I thought about shelving the book and writing another, but my readers said no, this is an important book and it needs to be out there. I tried everything I could think of to fix it: critique groups, contests with feedback, and my own rewrites – lots and lots of rewrites. Rewrites did finally work, but only after several years. I got into a workshop where a scriptwriter, who became my writing buddy, said, “Linda, it’s all here. Just rearrange it like this and add this.” And from there I landed a fiction agent and a publisher. But I was still lost because I didn’t know why the last rewrite worked. How could I reproduce this success if I didn’t know how I got it to begin with? I realized then why so many authors have a pile of books under the bed. 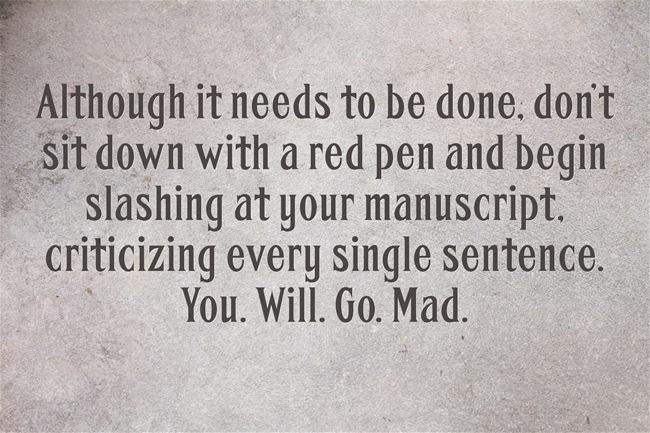 Instead of rewriting until it works, they write another book. And another. They hit on what works by accident, then work by instinct. friends, couldn’t help me. It’s like a painter who knows when it feels right, but can’t teach anyone else how to do it. Only I’m not that kind of gal. I hate hit or miss mode. Those of you who’ve been in my workshops know I like to work by principles I can apply in any situation. What my character wanted stayed under wraps until page fifty and that’s where she comes out and says to herself, “I’m done crying, I’m going to do something about this crummy situation I’m in.” And I let the reader see that. By the way, that’s also where the book got much easier to write. Before that, it was torture. The point is, I realized the change I made was that I changed the book so my protagonist was never without clear motivation shown to the reader. Now this sounds simple, yes? And obvious. But notice I never said it was EASY. Because it isn’t. This Big Mistake is no secret. I bought Debra Dixon’s book GMC: Goal, Motivation & Conflict at the conference bookstore during my first Pikes Peak Writers Conference (PPWC). Jim Frey, author of How to Write a Damn Good Novel and one of the keynote speakers at the 2009 conference, talked about writing well-motivated characters overcoming obstacles to achieve a goal. 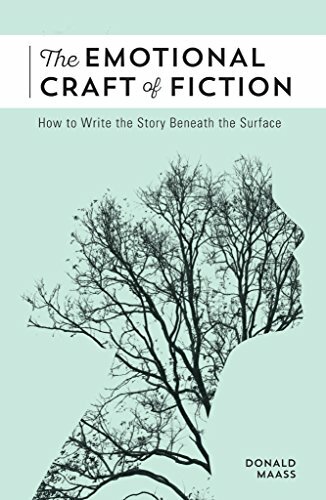 The late Dwight Swain, author of Techniques of the Selling Writer asked this question in the 1960s, “What does your character want and what is in the way of them getting it?” And in the 1940s, there was Lajos Egri’s classic, The Art of Dramatic Writing, a book Jim Frey said his mentor made him read forty times before he got this concept. Jim said he even made a tape recording of himself reading Egri’s book and played it over and over as he drove around doing his day job as an insurance adjuster. Bestselling and two-time Spur award winning author Dusty Richards once told me you cannot remind your reader too many times of your character’s goal. I own and read all these books. I could quote Dusty. But I didn’t hear any of this, if you know what I mean. Then I spent eight days in the late summer of 2009 in a brutal, intense, invitation-only workshop with Jim Frey in the California mountains. It was there I really saw this principle for writing fiction for the first time. 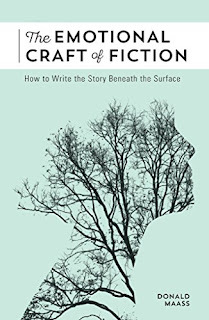 I got it on the first day, watching Jim coach other authors in the workshop (where we shared bathrooms, sleeping arrangements, and kitchen duty like kids at summer camp and spent twelve hour days for eight days working non-stop). Jim fervently complained he was tired of “teaching rocks to fly.” Now that I understand the principle, I get his frustration. What never ceases to surprise me now is when I read unpublished but extremely talented, and I mean mega-talented, writers who do not tell me, the reader, what the character wants. 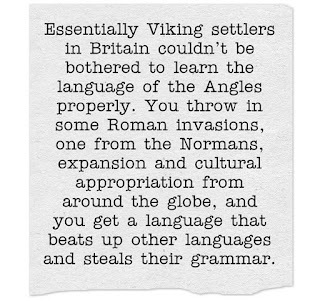 They do lots right. There’s a strong sense of place. They have voice. I start to get a feel for the characters right away. I can follow what’s happening. They even have the ability to write those one-liner’s I go back to re-read because of the way they turned a phrase. 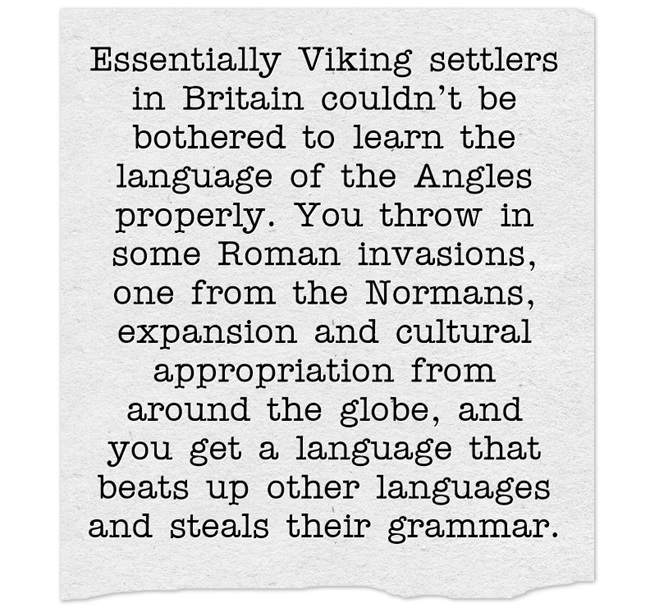 They’ve obviously been practicing their craft for a while, but they are making The Big Mistake. Of course, you can tell too much too soon. Brain dumps are to be avoided. But I see very little of that in writers who come to me for coaching. 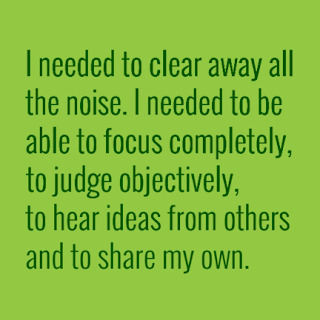 I was telling my story about learning this principle to a group of writers during a meal during a PPCW conference. To illustrate, I reached over and picked up at random a book on the table. It happens this mystery novel was getting “buzz” — it was up for a major award. I read it aloud to the table and I didn’t have to finish the first page to prove my point. 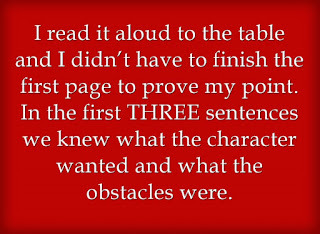 In the first THREE sentences we knew what the character wanted and what the obstacles were. I could see the light bulb go on for the writers at my table. Anyway, I hope this long treatise on The Big Mistake helps you get your light bulb moment. From experience, I know this isn’t an easy concept to grasp. 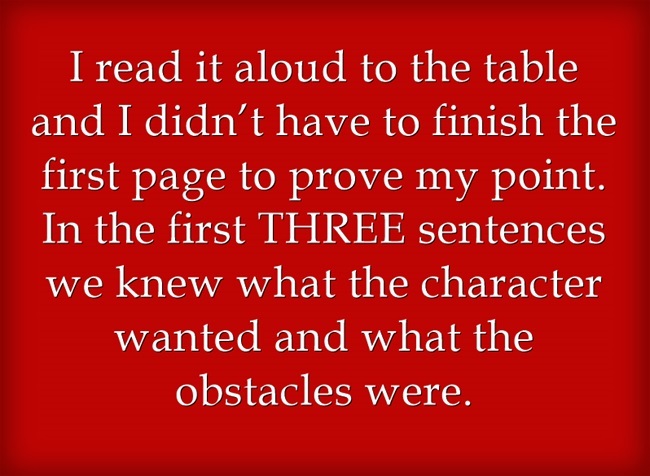 But once you get the principle of making sure your reader knows at any given point in the book (and especially in the beginning) what your character wants, and what’s in the way of them getting it, your writing will take a quantum leap forward. Tip: Record yourself reading each of these books and play them to yourself over and over.